"I'll gouge your eyes out..."
Immortality can be both a blessing and a curse, for you will eventually outlive your loved ones. That's the predicament that will put the main characters to the test. 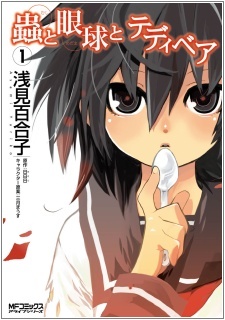 Mushi to Medama to Teddy Bear is a story about Gankyuu Eguriko, a girl who is searching for certain 'apples' inside humans whilst fighting monsters, serial killers, cultists, and solving murders with her spoons as weapons. She then meets an odd couple in her travels that she befriends, and their uncanny adventures begin. The premise of the story can be compared to "Adam & Eve", where apples are prohibited because they carry the burden of 'sin', and the antagonists play a similar role to that of the snake, but that can only be said about the main arc. Our main characters spend more time dealing with the unlikely murderous situations they find themselves in as they attend school. The character designs are very good, the mangaka opted for a more "loli" approach that can sometimes make the serious parts a bit dull since the story relies on many horror and gore moments. This is the epitome of how not to combine genres though. Many times the plot-driven parts lose their impact due to the unnecessary comedy that's found in between, but it's certainly a breather that can make the filler arcs a little more fun. Mushi to Medama starts strong but drifts into episodic arcs that stray from the real attractiveness of the main plot, which is why I might be a little harsh on the score. Still, if you're into cute girls, horror and fantasy, and a weird romcom with yandere and tsundere loli characters, this manga is for you.